Plan B Hits Another High Note! Ah yes we always wanted to be headline writers for the tabloids! So how have we hit another high note? 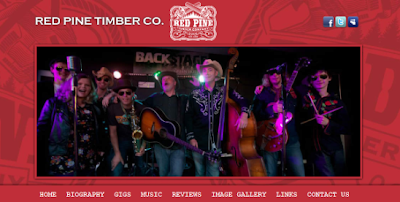 Simple really with a new Sitebuilder Bands site for Red Pine Timber Company. Yup Red Pine Timber Company - is that not just a brilliant name for a band? Their history? In the summer of 2009, a loose collective of musicians led by former Southpaw Singer/Songwriter and Guitarist Gavin Munro got together one afternoon during the Southern Fried Festival in Perth. They rehearsed just once before performing in front of the festival audience later the same day. The audience loved it and Red Pine Timber Company was born! They describe their style as Americana Country with a strong Celtic influence and through the band’s willingness to embrace talent when and where they find it, they now have a multinational line-up, an age range of 15 to 45 and, unusually, a horn section! How did Plan B enter the equation? Well we have been working with David Mundell of Mundell Music for many a year helping him promote his wonderful gigs and venues and in discussion with him we came up with the idea to develop SiteBuilder Bands aimed at giving bands and musicians painless access to their own content managed website. The plethora of social media outlets were available for musicians but we still believed that an anchored presence on their won website would be of major benefit to bands and musicians. SiteBuilder Bands was born and now provides a cost effective website option with support from someone who knows the industry really well. The website is built on a series of frameworks incorporating all the external links and feeds - bands can easily upload their YouTube videos, link to downloads, their social media or even their own iTunes or retail pages. looking to find more about an affordable band website? Why not contact David Mundell or Plan B to find out more. Plan B and Some of Our Hits! It's always good fund getting even within touching distance of the music industry and we've had some great fund working on some good stuff over the years. 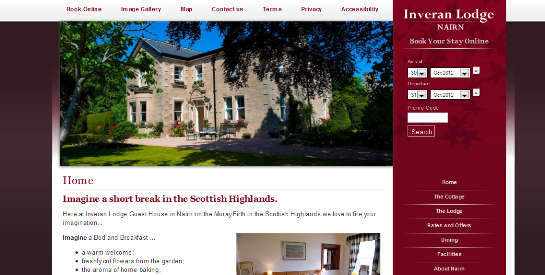 One of the finest guest houses in The Highland's has unveiled it's new look website in time for the 2013 season. Rosemary Young at Inveran Lodge in Nairn is well known for her discerning quality within her business and has built her reputation on going that extra mile with her guests as her reviews highlight. We at Plan B are therefore delighted that Rosemary has again entrusted her most important marketing tool to us again. Ian McCaig of Plan B explained, " This is the third generation website for Rosemary and Inveran and before that we were involved with her previous ventures at The Windsor and The Claymore in Nairn. I like to think we have a really string relationship that is built on absolute confidence. Quite rightly, Rosemary is demanding of the website's look feel and most importantly its content and we have always endeavoured to make sure that those demands are fulfilled." The new website utilises the brand new version of Plan B's own content and destination management system The Claymore 1314. It offers a bespoke solution to the hospitality sector offering easy to update content, image galleries and search engine terms as well as being able to manage new Mobile version websites and third part content. Hotels and guest houses can now even add a new language website in a matter of hours should they need it. However the main benefit for the guest house and bed and breakfast operator is the simplicity and control they have over their imagery, content and optimisation. The new Inveran website is part of the Open Rooms 1314 website packages which combines a full content managed site with fully integrated online reservations and bespoke design. The new design is based on one of the increasing number of Open Rooms frameworks and styled to the look and feel of the individual business. Ian continued, "This is not about rolling out mass market templates but it is about offering a website and online marketing strategy that is affordable yet allows for personalisation on a high level. We understand what the small operator needs and Open Rooms 1314 offers it"
Great news for dynamic accommodation marketing group Ayrshire Bed and Breakfast Association (better known as ABBA) who have been recognised as the top tourism organisation in Ayrshire by winning the 2012 Business Awards. These awards are run by the Ayrshire Chamber of Commerce, and the tourism award was sponsored by the Bank of Scotland. This was no mean feat for ABBA, who have only been in business for 2 years, and were up against stiff competition from many businesses in the tourism sector. With over 50 members already enjoying numerous benefits of collaborative working, it is expected that many other B&Bs will now join the Association. Congratulations to a very postive example of how collaborations can be made to work in the private sector. If you needed a reminder of how email marketing still works just have a look back at the Groupon style email driven campaigns of the last year. More than ever businesses need to be developing their OWN email marketing much more effectively to drive DIRECT lower cost sales. Your website may still be the core of your online marketing strategy but it is increasingly only a part of a much wider mix. It is essential that you can communicate with your previous clients or site visitors simply and frequently whether it is through social media, blogs, mobile technology or by good “old fashioned” email. Email marketing complements both your on and off line marketing strategies and should be developed as an integral part of the business’ marketing plan. Plan B having been using ConstantContact for our own email marketing for more than a decade now and are more than happy to work with thme now as partners. Email Marketing by Constant Contact® is the easy, effective, and highly affordable way to get your message out to your customers, clients, or members. You can create high-impact, professional-looking emails—quickly and with no technical expertise. And, most importantly build strong connections with your marketplace that lead to referrals, repeat business and loyalty. Build and manage your email list: import exis ting customer lists, add names individually, or capture contact information from website visitors. Measure your email campaign results instantly - check click-through rates, review new subscribers, and see who opened and clicked on each link so you can tailor your follow-up communications. 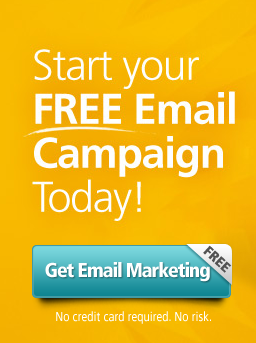 For an affordable cost we can set up your Constant Contact campaign to ensure that you’re ready to start emailing your target markets immediately. Plan B's RelationshipBuilder Email Marketing programme has a set up fee from £395 and includes all of the above. There is a monthly charge for the use of the system dependant on the number of email contacts in your database and this starts from as little as £10 per month and you can cancel at any time. You can also prepay and make further savings. Click for your free trial or contact us on 01292 521404 for further advice. Plan B and Bookassist - A Decade Together! Bookassist and their award winning booking engine software for accommodation providers has been an integral - and integrated - part of Plan B's product offering for nearly ten years! At that time it was clear that the hospitality sector was changing. We had our own tour operation based out of Prestwick Airport called Celtic Links and up until that time we would have had anything up to a couple of hundred people in Dublin at any one weekend for short breaks, golf holidays or concert packages. It may seem so long ago now but post millenium there were no airline bookings online, flights had to come thorugh a travel agency and we would receive 15% commission from Ryanair for selling their flights! And that was THIS century. And all rooms were booked by phone and confirmed by Fax! Email was not in widespread use in the hotels at that time. By chance we were booking a rugby weekend for ourselves and came across not only a hotel website but one with a Book Online button; we thought it would be one of these enquiry form confirmations but no it was live online availability, DIRECT from the hotel and confirmation came back to us instantly. We were impressed. met up with their Ops Director in Dublin and we've been partners ever since. 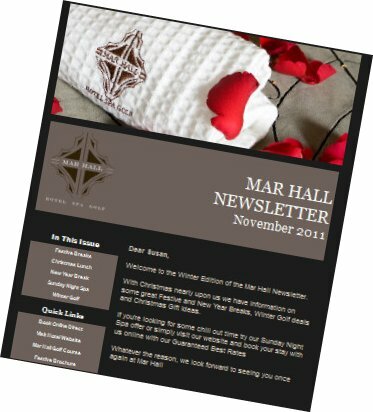 Nearly a decade on and we have a wonderful basket of properties and owners the length and breadth of Scotland who we work with to improve their DIRECT online reservations from Resorts such as Green Hotel and Mar Hall to fantastic guest house and B&B operations such as Callater Lodge in Braemar or Inveran in Nairn. And everything and everywhere in between. All in all we have around a hundred properties all over Scotland utitlising not only the leading edge technology of the Bookassist booking engine but also the creativity and business support of the Plan B team. Presentation Call from a Plush Marketing Agency Office, (Somewhere, Anywhere) to VisitScotland Chairman..
"Mr. Chair, we've got a wonderful promotional opportunity for you sir." say the richly rewarded external PR consultants down the telephone line to Leith. "It involves you handing over a special achievement award to the pandas." Pregnant pause at the other end. "Yes sir a special achievement award sir. Those pandas have worked their asses off for Scottish tourism since they arrived last year and we wanted to give them an OBE but apparently that's not going to be possible. So we've decided to give them a Scottish Thistle Award." "No sir, I can assure that the Chinese Embassy have not been pressing us constantly for the past three months for an award." "Yes we did consider Mr Trump. The Golden Comb award had the wind taken out of its sails by Bute House"
"Undermining the value of the awards? I'm not sure what you mean, sir. 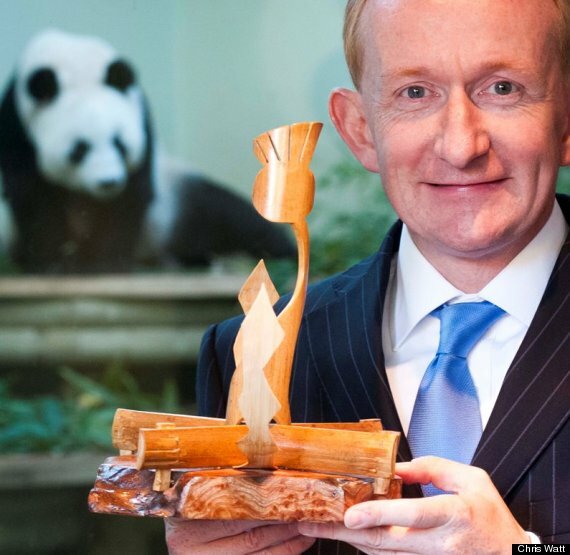 No-one deserves this tourism Oscar more than this international couple do and we've designed a special award made from bamboo which gives us a fantastic title for the press release." Yes sir, I did say "Bamboo’ll do Nicely." "We've written a great quote for you too sir. We think it's just the sort of thing you'd say on your own. "Yes sir, that's right sir. Giving animals awards is indeed what the Scottish Thistle Awards are all about - just look at some of the previous winners sir." "And we've got a great outro too which will promote the awards ceremony. "Despite their dedication to tourism and suitable black and white attire, Tian Tian and Yang Guang are not expected to appear at the gala dinner and awards ceremony in Glasgow. Zoo keepers at the Edinburgh visitor attraction assured the national tourism organisation that the pair would indeed be there in spirit." Hint of a distant and resigned sigh from the other end of the phone. "Thank you sir, we'll draft it up straight away." Marketing creatives scuttle away thinking about how they can next year ensure that Scotland is nominated at The Oscars for the "Best Supporting Marketing Act for Over Hyped Cartoon Feature 2012"